We have a small quantity of these extremely well built Vickers microscopes. All original and therefore also collectors pieces. Large stable illumination base with 6v 15watt lighting. Stage with slide clips and usual substage condenser with iris. Coaxial coarse and fine focus controls. Objectives x5, x10 and x40 with x10 eyepiece. Very good value for a vintage British made microscope. 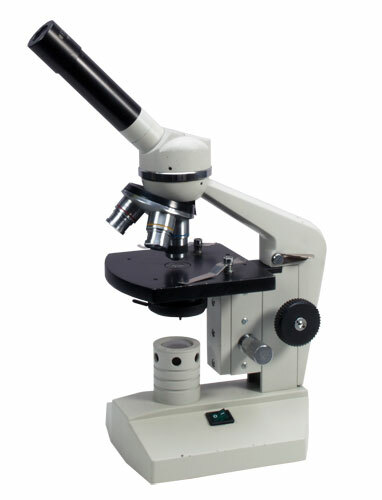 This is a new monocular low power microscope ideal for the student or as a quality instrument for beginners. 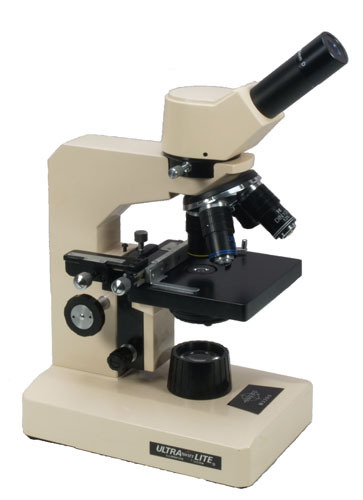 The microscope gives a x20 overall magnification which is ideal for most natural history applications - plants, insects, flowers,coins, stamps etc.. Pole stand coarse focus with a fine focus rack and pinion mechanism. A bargain. 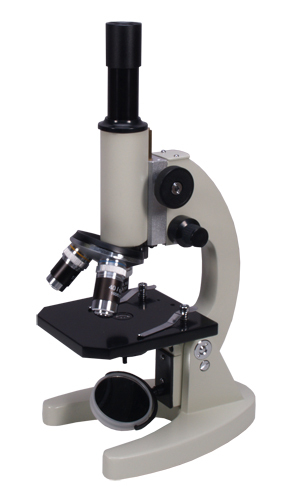 There is a reason why this microscope has been probably our best seller during the last 15 years or so. It marries together optical performance with mechanical durability. Easy for us to say - because we make it - but sales figures can’t lie. Either way this is a demonstration model with objectives x4, x10, x40 and x100 with a wide field eyepiece x10 giving a magnification range of x40 to x1000. Coaxial coarse and fine focus controls, full mechanical stage with substage condenser. LED illumination system. Recommended. 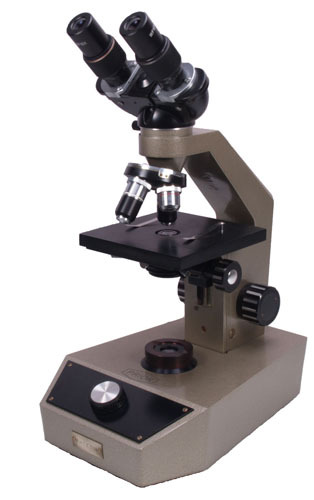 Originally sold by ourselves this is a very good value binocular microscope. Achromatic x4, x10, x40 and x100 (oil immersion) objectives with x10 wide field eyepieces giving a magnification range of x40 to x1000. Mechanical stage with drop down coaxial controls and double vernier scale. Substage condenser with iris diaphragm. Coaxial coarse and fine focus controls. Tungsten light source with brightness control. Condition excellent. An ex demonstration microscope used only by ourselves for a few months. Objectives (standard RMS) x4, x10 and x40 giving an overall magnification of x40 to x400 with the x10 wide field eyepiece. Coaxial coarse and fine focus controls. This microscope has two light sources, both brightness controlled. The transmitted light is used for examining standard microscope slides and the top light enables solid objects such as insects, leaves etc to be examined at x40 and x100 (the x40 objectives gets too close to the specimen to let the top light in). 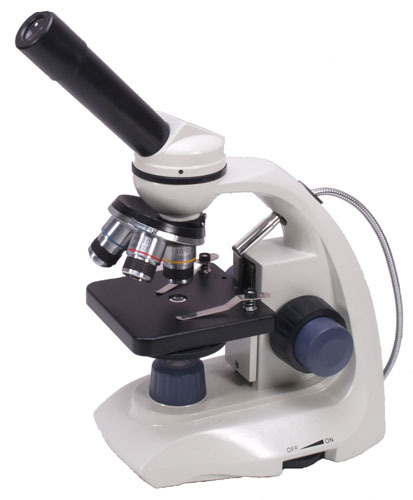 An ideal starter microscope for the young scientist. Aimed at the educational and schools market this is a very robustly built microscope from Holland. There are several minor chips to the body paint work which in no way detracts from its performance. An ideal starter budget instrument - made to last. Objectives x4, x10 and x40 with a turret space for a x100 (can be supplied). Separate coarse and fine focus controls. Fixed Abbe condenser with iris diaphragm. Good sized stage with slide clips. Tungsten illumination. Used only by ourselves for customer demonstrations . This is the SP60 Mk1 model which has now gone through some style changes to the current model. Trinocular head with x10 wide field eyepieces. Achromatic objectives x4, x10, x40 and x100 (oil immersion). Mechanical stage with double vernier scales and drop-down X Y controls. Coaxial coarse and fine focus controls with safety lock and tension adjustment. Kohler LED lighting with brightness control. A good microscope and this unit is pristine. Excellent value. There are not many occasions that excite microscopists, but the introduction of this dual function microscope is one of those rare events. It has always been a truth that because of the laws of light physics you need two microscopes for both slide examination and low power whole object study. This microscope manages to bridge both functions in a very clever way. Its key components are a removable circular slide stage with an integral Abbe condenser. This can be removed easily and replaced with either a black/white dissection plate or a petri dish and the whole assembly can be moved up and down the rack and pinion dovetail to massively increases the working distance. This is to facilitate the working distance of the x2 objective which is approximately 100mm. The other objectives are x4, x10, x40 and x100 (oil immersion) that have normal short high power microscope working distances. 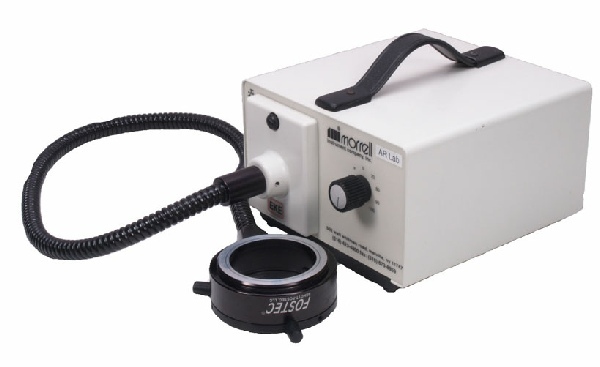 In net effect with the standard circular stage in place this is a high power microscope with a magnification range of x40 to x1000 and suitable for slide examination. Alternatively with the circular stage removed, replaced with the petri dish and lowered, the x2 objective gives a x20 low power view suitable for whole objects that are illuminated by the flexible LED light from above. Both this light and the transmitted light have brightness control. Whilst this microscope almost ‘squares the circle’ in microscopy terms, and the x2 objective gives an image very similar to standard stereomicroscopes it is still inverted like all compound microscopes. It is therefore ideal for low power examination of whole objects but not dissection because of the inverted image. 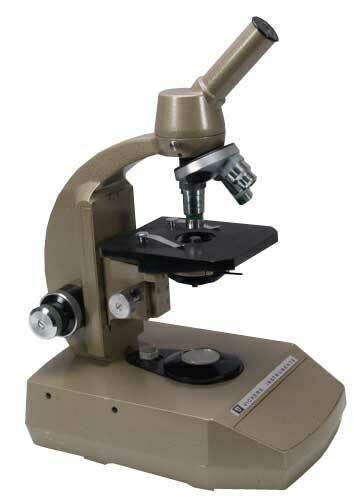 This is a new microscope used only by ourselves for assessment purposes. Ideal for the beginner and student. A good strong stable stand with separate coarse and fine focus controls and mirror illumination. There is a full mechanical stage with drop down controls and a focusing substage condenser with iris diaphragm. RMS screw thread achromatic objectives x4, x10, x40 and x100 which with the x10 wide field eyepieces gives a magnification range of x40 to x1000. A new microscope used only by ourselves for assessment purposes. 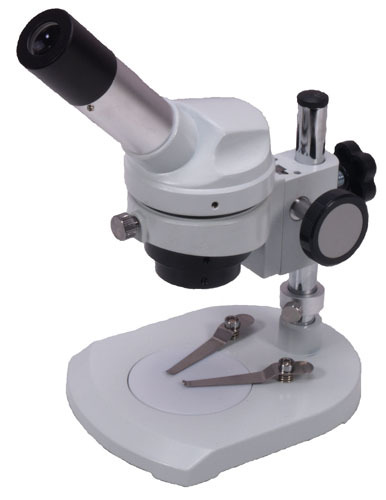 This microscope has achromatic objectives x4, x10, and x40 which with the x10 eyepiece provides a magnification range of x40 to x400. Separate coarse and fine focus controls. Square stage with slide clips and disc light control. Tungsten lamp lighting. An ideal microscope for the beginner or young scientist. Condition as new. Used only by our sister company (Apex Microscopes) for customer demonstrations this is in effect a new microscope. This is the most popular of the Apex microscopes in the amateur microscopy market with a pedigree that goes back at least a decade. LED illumination with brightness control, full mechanical stage with focusing sub stage condenser, coaxial coarse and fine focus control, slide safety stop. RMS achromatic objectives x4, x10, and x40 with wide field x10 and x29 eyepieces gives an overall magnification range of x40 to x800. Condition pristine - a good saving. 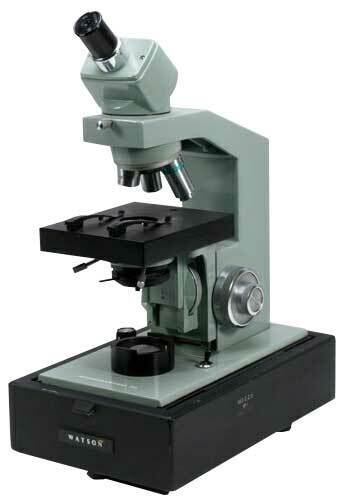 A solid binocular microscope made by the UK manufacturer Prior some years ago. A heavy stable base with the signature single coarse and fine focus control mechanism. The stage has slide clips and a full focusing substage condenser with lateral adjustment. New achromatic objectives x4, x10, x40 and x100 (oil immersion) with x10 wide field eyepieces giving a magnification range of x40 to x1000. 6v 15 watt tungsten illumination system with bright ness control. Originally supplied by ourselves and traded in during an upgrade. In excellent condition apart from a few small paint chips on the front of the base - just visible in the photograph. Objectives x4, x10, x40 and x100 (oil immersion) with x10 wide field eyepieces giving a magnification range of x40 to x1000. Mechanical stage with drop down controls and a full substage condenser system. Coaxial coarse and fine focus system with tension adjustment and safety stop. 6v 20 watt halogen illumination system. Imported from the USA, this is a good quality fibre optic light source with a continuous ring light. The ring light can attach to a stereomicroscope head up to 60mm in diameter via three clamping screws. Fan cooling with brightness control. Condition very good and supplied complete with a voltage adjustment unit (110 to 240v adjustment).